Naples attraction-guides.com - Naples, Italy attractions guide Naples Teatro San Carlo (San Carlo Theatre) information about attractions, architecture, acoustics, opera, Palazzo Reale gardens, backdrop, location and address details, Via San Carlo, tel / telephone number, general tourist information about Teatro San Carlo in Naples (Napoli) area, Italy (Italia) IT - Last updated 30/10/2012. 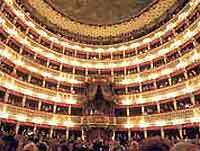 The Teatro San Carlo (San Carlo Theatre) is located in the Toledo area of Naples and dates back to 1737. Taking just over eight months to complete, Naples' striking Teatro San Carlo features beautiful architecture and outstanding acoustics. The Naples San Carlo Theatre is the ultimate experience for Opera lovers in Naples and the original theatre was destroyed by fire in 1816 and completely rebuilt shortly after. Attractions at the Teatro San Carlo (San Carlo Theatre) include six levels of seating areas, around 200 boxes, and an enormous stage featuring a truly unique backdrop that can be removed to reveal the gardens of the Palazzo Reale. Tickets for performance at Naples Teatro San Carlo can prove difficult to obtain and are often fairly expensive, but some hotels in Naples are be able to obtain them more easily. Guided tours of the Teatro San Carlo (San Carlo Theatre) are available at the weekend, between 14:00 to 15:30.